30 years, 13 albums, a legendary status with a cult following as old as the band itself. A completely unique sound that paved way for generations of extreme metal musicians prone to smash out odd sonorities and uneven beats. So where do you begin? cancer robbed us of one of the most brilliant guitarists rock music has seen and heard. Daniel Mongrain, now known as Chewey, filled in as live guitarist, and seemingly infused the old guys (they are all approaching their fifties) with new energy to carry on and represent Voivod in the 2010’s not only as a moving museum honouring past acheivments but as a vibrant, living entity, as strong as ever before. So the big question is, do they succeed? And the answer is: quite so! Raised in the Voivodian school of progressive science fiction thrash, Chewey knows and understand what Voivod is and represents, from within as a touring musician and from without as a life long fan. Killing Technology (1987) was supposedly his first metal album, that inspired him to pick up the guitar – I might quote a Swedish review: Chewey was born to shoulder the guitar in Voivod. The shoes that Piggy left behind him are perhaps not the biggest in metal to fill, but surely the most odd-sized and ill-fitting, and no-one could have stood up to the task as Chewey has. The unsettling, unforeseen chord structures, the ominous, free-floating (dis)harmonies, the interplay and dynamic contrasting with Blacky’s earth-shatteringly heavy and playful bass lines… it is as if they took all the legendary albums from the 80’s and the undeservingly overlooked ones of the 90’s, ground them into dust, snorted it and flew right into the 2110’s when they created this beast of an album. That wasn’t a typo by the way, Voivod are still creating progressive thrash metal for the future, from the future. Like cyborg sentinels sent back in time to ward off the impending catastrophe inherent in all mankind’s undertakings, Voivod’s music is still based on that unsettling dynamism of primitive and feral versus intricate and abstract. Tribal expositions of rebellious violence set against uncomfortable yet somehow beautiful calm, like flesh protruding from complex circuits. Paranoia. The melancholy of a civilisation set to destroy itself and taking their world with them, against bursts of activity and hope. 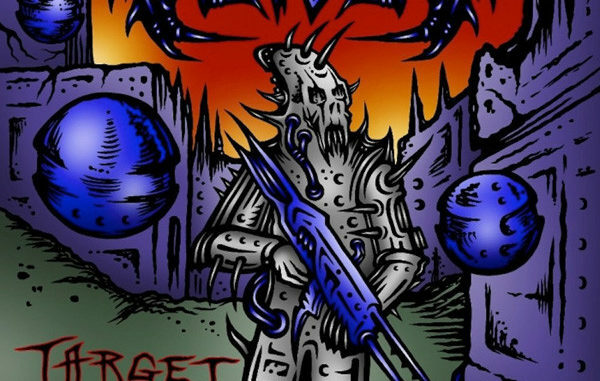 The catastrophe, the collapse, is never far away in the world of Voivod. Sometimes it has already happened, and other times it is happening constantly, but there are no traces of nihilism or hopelessness here: it is all a movement forward, into the unknown, regardless of where we end up. Voivod lights the path ahead of us.